In an emotional project for Dashni, the Green Kids team travelled back to her birthplace of Sulemany. Whilst it was tough to return so many years after fleeing as a refugee, she was overjoyed to see how the school had been renovated for the better, with bright colours and happy children. 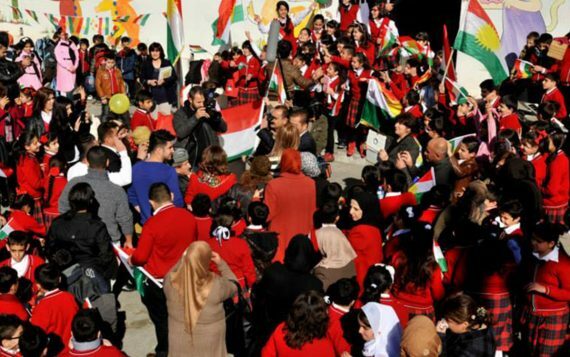 Joined by the boy band L.S, the Green Kids team visited the school on Kurdish National Flag day. The kids were incredibly excited to see one of their Alumni, and the team were delighted and surprised to see how happy they were. Green Kids recruited a huge team of volunteers, many of whom were unemployed and glad of the work experience, and took books and school supplies to the children, as well as helping to create their garden – where children can learn the wonders of nature that Dashni loves so much herself, and the importance of looking after it. The day developed into an impromptu concert in the school’s garden, leaving little time to distribute the books!